Urdu is national language of Pakistan. Urdu and English are official languages of Pakistan, however Supreme Court of Pakistan has ordered the government to make Urdu as sole official language and eliminate English. Punjabi, Sindhi, Pashto and Balochi are provincial languages. And there are many other regional languages. Majority of the Pakistani Muslims can also read Arabic, as Muslims recite Holy Quran which is in Arabic language. Some students also study Arabic in Schools, Colleges and University level. Majority of the Pakistani people can speak or at least understand more than one language. Urdu is the first language of only about 8 percent Pakistanis but it is widely spoken and understand by most of the Pakistanis. Punjabi is the largest language by number of speakers with about 44%. 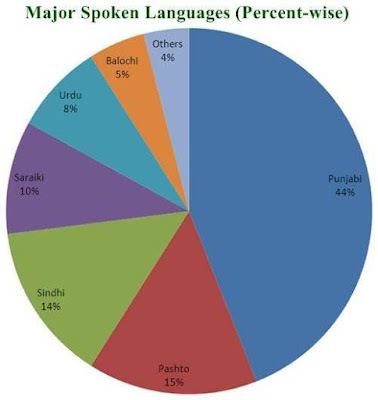 Other major languages are Pashto (15%), Sindhi (14%), Saraiki (10%), Urdu (8%) and Balochi (4%). Speakers of other languages are about 4% of the total population. Some experts say that Saraiki and Hindko are dialects of Punjabi while according to some other these are separate languages. Saraiki was included in Punjabi in 1951 and 1961 census. This chart is based on the number of speakers with first language. Following languages are spoken in Pakistan. It is my effort to enlist all the languages spoken in Pakistan. If you find any mistake in it, please play your role and mention the correct information in the comments. My friend, you completely forgot about English. Hey I wanna see the 2017 linguistic composition but I just can't find it anywhere! Can you plzz upload it on your website!